The loom did not come as any sort of surprise, and I was so excited by the mere prospect of weaving that three days before Christmas I had the girls pick out some fiber from the stash that I could spin up for scarves for them. 212 yds/4 oz, 10-14 wpi. I spun this using a point-of-contract draw (i.e. using the twist to pull fibers out from the drafting zone). I ended up with something very squooshy and soft and lovely. 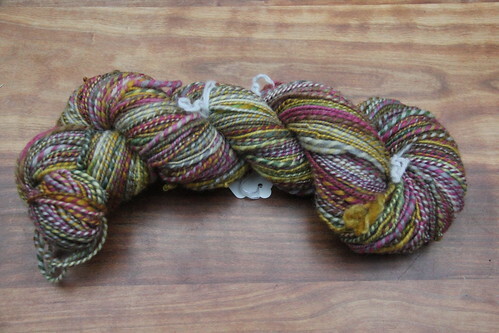 After I spun this up I got a bit concerned that it wouldn't hold up to being warp, so I did a little research on how to spin strong warp yarns, which I applied to Boo's scarf yarn. Boo chose HY Merino in "Overfond". 256 yds/4 oz, 8-10 wpi. 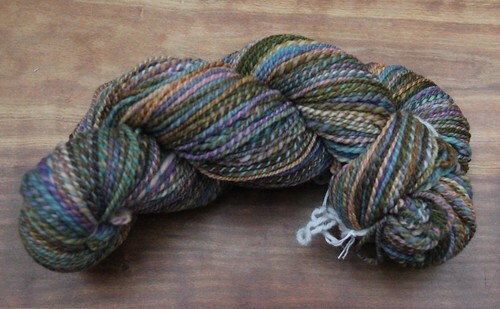 I spun this worsted (inchworm drafting), with lots of twist, and I'm much more confident in its ability to hold up to weaving strain. At that point, I was so hopped up on the spinning-for-weaving idea that I jumped into 100 grams of wool/silk blend that I got in a trip down to Guilford to George Weil. 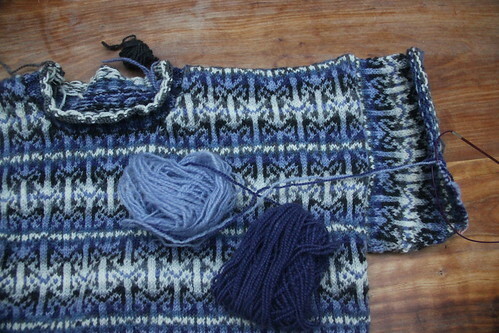 I've also been working on the River Run Pullover again, now that I've got a firm, final, finish-or-be-damned! deadline on it (aka Himself's birthday). I spent yesterday on the couch, recovering from my wicked plague, and working one repeat of the sleeve. Ooof. I'm not sure it will ever be done! 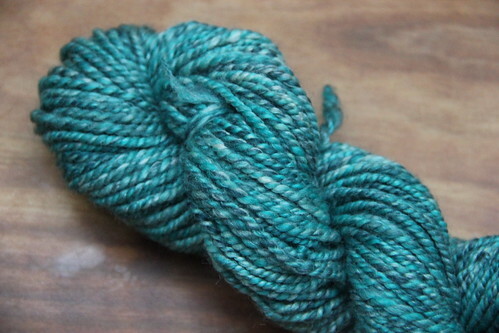 Written by porpoise On January 13, 2012 In "River Run Pullover", "spinning", "weaving"